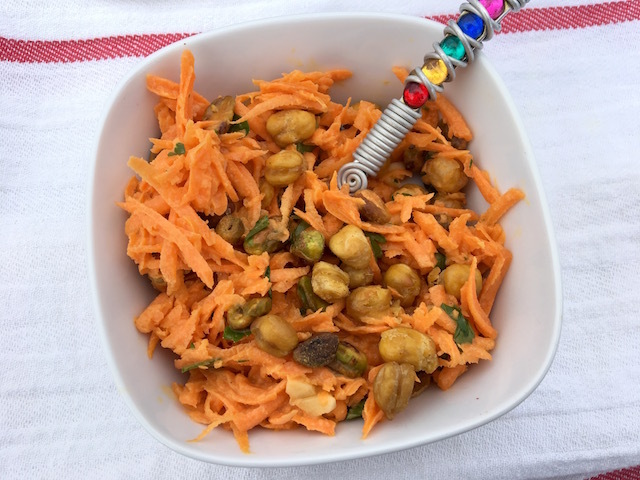 I titled this “Middle Eastern” carrot salad just because…cumin, roasted garbanzo beans, tahini, lemon, pistachios…need I say more? This salad was calling my name and originally came from the Smitten Kitchen website. As always, I did some tweaking and I have to say, I’m pleased with the results. On a hot summer day when you can’t bare the thought of another lettuce salad, make this. It is crunchy, tangy, sweet, chewy and just downright delicious. Heat the oven or toaster oven to 425 degrees F. Dry the chickpeas in a couple of paper towels and toss them with one tablespoon olive oil, salt and cumin until they’re all coated. Spread them on a foil-lined rimmed baking sheet or pan and roast them in the oven until they’re browned and crisp, about 15 minutes or even longer. Shake or stir them occasionally to make sure they’re toasting evenly. Set aside to cool until needed. Note: if you want to cook your own chickpeas, try your pressure cooker! I didn’t even soak the beans and they came out so darned perfectly in 45 minutes start to finish. Fellow pressure cookerites can write me if you want explicit instructions for this. Whisk all ingredients together until smooth, adding more water if needed to thin the dressing slightly. Be aware that it thickens as it stands. Taste but I wouldn’t mess too much with it even if you taste a lot of lemon. This sourness contrasts nicely once you put this on the sweet carrots. Place grated carrots in large bowl and toss with the parsley. Mix in a little over half of the dressing, adding more if desired. Taste, then more salt and pepper if needed. Right before serving, sprinkle with the roasted garbanzo beans and pistachios. I often make just the oven crispy chickpeas as a type of pre-dinner munchie. I learned this from my Israeli friends, and adults as well as kids adore them. Finally, I made this again and used fresh roughly chopped mint leaves. It tastes totally great and is a nice refreshing change from parsley. This entry was posted in Salads & Dressings and tagged middle eastern carrot salad. Bookmark the permalink.